PowerMTA is the first MTA or Message Transfer Agent (an MTA implements both the client (sending) and server (receiving) portions of the Simple Mail Transfer Protocol aka SMTP) certified by Goodmail System’s for use with their CertifiedEmail service, assures delivery of senders’ email campaigns to inboxes of subscribers of leading mailbox providers, including AOL and Yahoo!, by distinguishing approved emails from spam and indicating they are safe for your customers to open with a certification symbol. Port25 offers a certified MTA appliance or software solution that can be easily deployed in the most demanding enterprise environments. Different throughput capacity options are available with very attractive pricing, offering a great solution for accredited senders of all sizes with various requirements. The latest version of PowerMTA 3.2 has expanded capabilities including support for Goodmail’s CertifiedEmail on Windows operating systems and support for 64-bit Linux systems. Port25 is dedicated to leading the industry in performance and flexibility, while catering to the specific requirements of ESPs, email marketers and complex customer communications. 66% of the Leading ESPs trust PowerMTA from Port25 Solutions to enable maximum deliverability as their Message Transfer Agent. 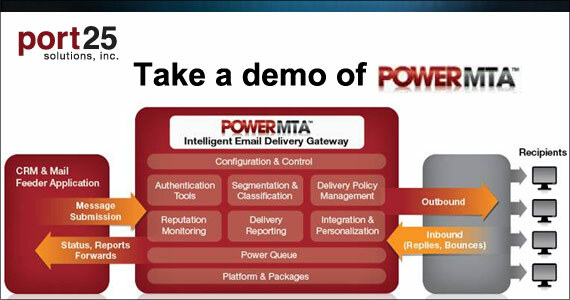 PowerMTA software from Port25 Solutions is focused on maximizing outbound email delivery. For ESPs and Enterprises. 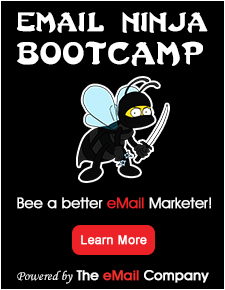 PowerMTA software from Port25 Solutions enables you to discover brilliant email execution. For ESPs and Enterprises. 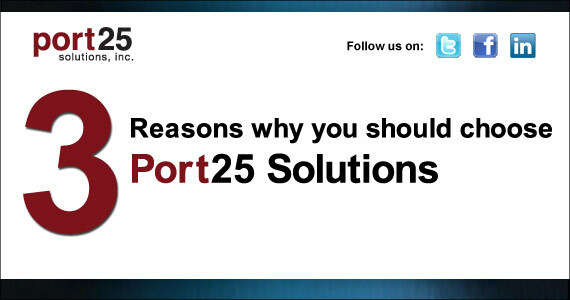 Why PowerMTA from Port25 Solutions? Port25 Solutions Inc. provides specialized email infrastructure software products that address the increased unique demands of client communications and email marketing applications. PowerMTA, Port25’s flagship product, provides senders with superior performance and advanced features to proactively manage their sender reputations. Port25’s global footprint includes 66% of the leading Email Service Providers as published by Forrester and enterprise level clients such as MySpace, CareerBuilder, and the New York Times. Port25 is a member of the Email Sender and Provider Coalition (ESPC) and MAAWG. Founded in 1999, Port25’s mission is to help realize the potential of email as a platform for legitimate and effective customer communications. Visit www.port25.com for a fully featured product evaluation. 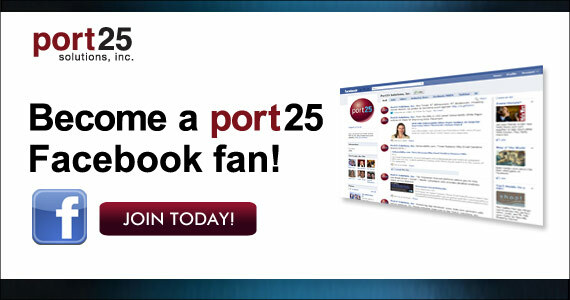 Become a Facebook fan of Port25! Port25 is on Facebook sharing the latest news and tips for email marketers looking for the best deliverabiltiy solution! Check out what our fans are saying about us in these videos! PowerMTA is the leading email gateway software product built to address the challenges of email marketing and customer communications. First released in 1999, PowerMTA has evolved to meet to the ever-changing set of problems confronting outbound mailers. PowerMTA 1.0 was written from the ground up to address the performance and integration needs of customer and prospect communications applications. PowerMTA 2.0 added advanced control features to help senders navigate the deliverability challenges created by first generation anti-spam solutions. PowerMTA works hand-in-hand with your custom-developed or packaged CRM application to ensure optimal delivery and tracking of your customer email. Messages are submitted to PowerMTA for delivery (and merge) through a standard interface based on SMTP or through proprietary API’s available in common programming languages such as Java, C, C++ and Perl. As an “MTA” (Message Transfer Agent), PowerMTA is responsible for the core tasks involved with external message delivery, including: queuing, scheduling, connection management, data transfer, processing of deferrals, bounce generation, and tracking of delivery status. PowerMTA handles these core tasks with greater efficiency, intelligence and control than general purpose MTA’s because of our proprietary architecture designed specifically for customer and prospect communications. The features PowerMTA offers are unmatched. We focus on message delivery and strive to meet your unique needs. In addition to being your outbound gateway, PowerMTA is also your high-speed inbound gateway for handling replies and remotely bounced messages. Here again, its performance, integration capabilities and intelligence offers a distinct advantage over general-purpose inbound email relays.